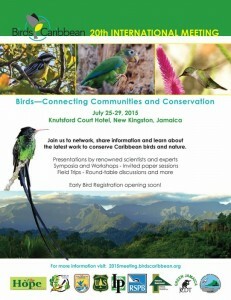 This summer, the largest international conservation organization in the Caribbean, a non-profit called BirdsCaribbean, will hold its 20th International Meeting in Kingston, Jamaica (July 25 – 29, 2015). Around 200 scientists, ornithologists, conservationists, bird-lovers, wildlife photographers and more are expected to descend on the Knutsford Court Hotel. Yes, another long-winded conference where everyone eats and drinks and talks and sits around, you may think. But no, not so fast. The theme of the meeting is “Birds: Connecting Communities and Conservation.” Apart from the delightful alliteration, there are some interesting and profound messages in this phrase. Nowadays, do we ever stop to consider our relationship with the environment we live in? The air we breathe, the water we drink, the sunshine, the trees and the creatures that we share this planet with? Are these essential things all simply laid on for our use – yes, the top of the food chain, the human being? Do we even think about it? Or do we continue to help ourselves – unaware, careless and with the implicit belief that we owe this Earth nothing. Nothing at all? 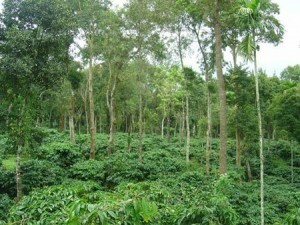 Shade grown coffee: helps farmers, helps birds, helps coffee. So how do birds build that bridge between us humans, who think we’ve got it made – and nature, which is not so sure all is hunky dory? Firstly, observe their behavior.Whether one is “religious” or not, one knows that everything has its purpose. Every small creature is here for a reason. Each contributor to that mosaic, large or small, makes up the mosaic of colorful, vibrant life that we call biodiversity. So why is a small bird important to us humans in a practical, everyday kind of way – quite apart from its beauty, its presence, its song every morning when we wake up? Well, let’s look at a Yellow Warbler in Costa Rica or Jamaica, for example, which eats the coffee berry borer beetle, a devastating pest. Our relationship with that bird is that it helps the coffee farmer. So, as in any relationship, the coffee farmer might help the bird in return by planting shade trees that will also benefit his coffee plants as well as the birds. A connection has been established. One can actually put a value on the amount of money the farmer will have saved. It’s what businesspeople like to call a “win-win” situation. It has often been said that with our current, increasingly urban lifestyle we are becoming separated from our natural environment – from the place where our very existence began. A kind of estrangement has begun. Perhaps it is a little easier for rural dwellers – farmers or fisherfolk – to establish these important relationships. But we can do so in our own back yard. We know, don’t we – there are young people in Jamaica who have never felt that connection with nature – who have never even dipped their toes in the sea! A joint program between Jamaica Environment Trust and RISE Life Management Services (the latter organization works with youth at risk in downtown Kingston) a few years ago successfully brought the young people out of the narrow confines of their lives into a new world of discovery. 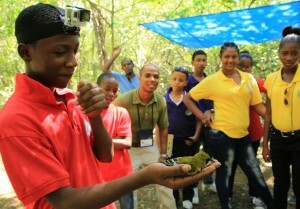 Last year, BirdsCaribbean visited several Jamaican schools to teach them more about the value of birds. The scientists witnessed the excitement and wonder of a student in Manchester participating in an educational field trip, who held a small wild bird in her hands for the first time. Let’s “tell the children the truth” as Bob Marley said – and let them experience it too, away from their video games and televisions. Out there is the truth. The July meeting will also include a children’s program. So – here’s something remarkable: A small creature like a bird – a bundle of feathers, light as a whisper on your finger – can teach us much about who we are, and where we are heading. In very simple, practical ways, migratory and resident birds (and other wild creatures – lizards, bats, even insects) can teach us a great deal about climate change, for example. A study of cockroaches (certainly my least favorite of all) has proved their remarkable ability to adapt to climate change. This is why they have been around for far, far longer than we have. In fact, they may well be around long after we are gone. Yes, we – the human race. I am not particularly optimistic about our survival prospects, on the current trajectory. Now. When are we going to tune in to our small life companions on this Earth. Can we try and understand the messages they bring? It’s actually not hard, by the way. We just need to observe more, go out and just look around us. We should pay attention to the signs of change. At home, we noticed recently that because our climate is drier now, we rarely hear tree frogs outside our window – those tiny voices that my father used to complain kept him awake at night when he visited us. We also need to take action, to live more closely in harmony with our fellow Earth-dwellers. We all depend on each other, after all. So, if we don’t spray every croaking lizard in sight, for example, we may well find that we have fewer mosquitoes, ants and other insects we abhor. Let’s teach our children not to throw stones at owls and John Crows – they each perform a function. Do we want to suffer from more of the vermin that impact our health (owls eat rats and mice)? Do we want to endure more decomposing carcasses on our roads (John Crows can deal with them in no time)? And this all begs the question: If we humans are so sensitive to changes in our environment – the Riverton dump fire, for example, which caused chaos, confusion and suffering for two whole weeks – then why do we persist in destroying it? Or does someone have some secret formula for human survival we are not aware of? If you would like to know more about the BirdsCaribbean meeting, please take a look at the conference website, which is being updated regularly, here: https://sites.google.com/site/birdscaribbeanmeeting2015/home Birds Caribbean (two separate words) is also on Facebook and on Twitter @BirdsCaribbean. You are right on with this essay, Ms. Emma, thank you! We are all connected and we, all biodiversity on earth, are a community that depends on one another for our survival. Let us us respect, appreciate and take care of nature and it will take care of us! Thank you very much, Lisa! Yes – respect is a word that Jamaicans love, and we need to apply it to our environment too! It will benefit us all… Thank you for your comments. Thank you for sharing this beautiful thought and reminder to respect our diverse interconnectedness as part of the eco-system we share. I’m Surprised about some youths in the inner city not having access to what make Jamaica the jewel of the Caribbean. This will indeed be a invaluable opportunity to put Jamaica and the Caribbean in the spotlight as a center for plant life, animals, and ecosystems that are a unique global heritage. Thanks for further making the connection between Jamaica’s natural environment and health – very relevant. Great work Emma Lewis!! Thank you so much! It’s a little hard sometimes to describe and point out how important this connection is. But it is essential to human wellbeing and the survival of the planet! Thank you, Angela for your comments. It is sad that our inner-city youth are often estranged from their own beautiful island. But poverty is often literally a trap. A trip to the country costs money…The horizons are so narrow. Indeed, everything/everyone is connected! Thanks for reminding us in your easy, conversational tone. Observing nature can be so enriching and it is sad that our hectic lifestyles tend to deprive us of this enrichment. Thanks, Celia! Yes, it is so easy to separate yourself from it, almost without realizing. I think that is what keeps us whole and human… And this is why I love my yard full of trees and birds!